Currently closed - Opening May 2019! We deliver locally depending on the number of bales requested or you can come to the farm to pick up your order. 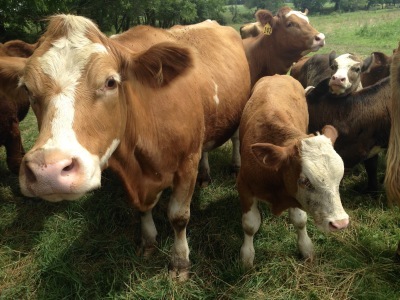 Simmental beef cattle, known for leanness and docile nature, are born and raised on our farm. Our animals are pastured seasonly and fed a balanced diet of grains we grow. We do not use hormones or antibiotics. Our beef is available by the quarter, half, or whole for the freezer as well as select cuts by the pound. Additionally, we raise chickens each spring to sell as freshly frozen whole roaster chickens throughout the season while supply lasts. Spring flowers are just around the corner! The Farm Stand location will open for business in May 2019. Fresh eggs, beef select cuts, whole roaster chickens, pasta sauce, ketchup, beef jerky and sticks are availabe at the farm. Cage free all natural brown eggs sold year-round at the farm, seasonally at the farm stand location, and at each farmer's market location.